The name Peter Wilson won't have meant much to many of you before last week. In fact, to some, it still won't mean a thing, despite him winning one of Team GB's gold medals that has helped them to third in this years Olympics medal table. That's probably because he participates in the oft-considered minority sport of shooting. This, however, shouldn't diminish his accomplishment in the slightest. On the contrary, we should celebrate the fact that these sports are getting support. And you get all of this for just £95. There are only 66 places available for this fun-packed day out, so hurry up and book now. 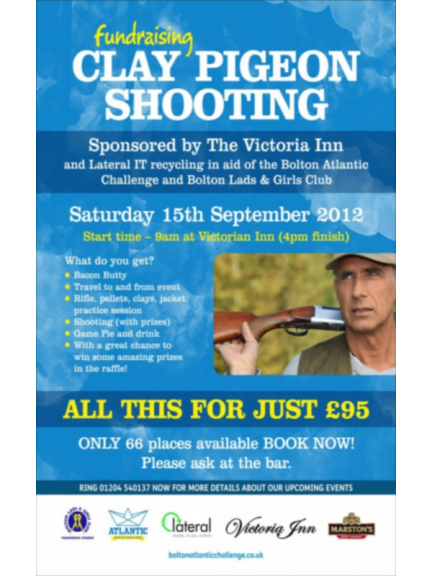 You can book your place at the Victoria Inn (Fannys), or call (01204) 540137 to get more information. All proceeds will go to the Bolton Lads & Girls Club, the biggest youth club in the UK, which helps thousands of vulnerable and torubled youths every year. It will also go some way to promoting the Bolton Atlantic Rowing challenge, where 4 men will row 3,000 miles in 7 weeks from the Canary Islands to Barbados. More information on that can be found here.